After more than 100 years of absence from the United States, a wild population of North America’s largest land mammal may soon be reintroduced to Alaska: wood bison. Larger than plains bison (Bison bison bison)—which may weigh up to 1,900 pounds—wood bison (Bison bison athabascae) bulls tip the scale at up to 2,250 pounds. 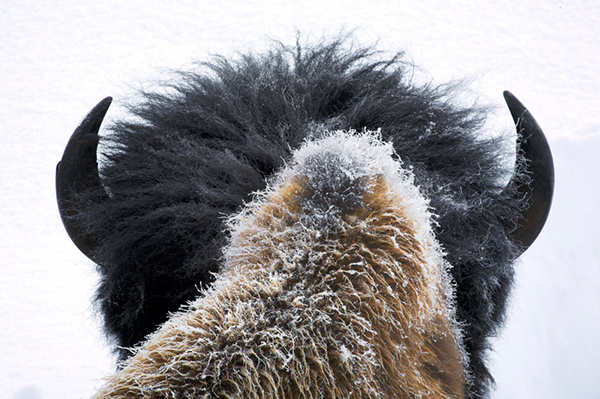 The shaggy-coated wood bison, however, have short horns that extend sideways and back from their heads, while the horns of their “cousins” on the plains are much larger. Wood bison lived in Alaska for most of the past 5,000 to 10,000 years, but they had virtually disappeared by 1900. Habitat changes during the Holocene period and hunting are thought to be the major factors in their decline. Canada has successfully established seven free-range, disease-free wood bison herds within its borders, resulting in the reclassification of the wood bison from endangered to threatened under the Endangered Species Act. 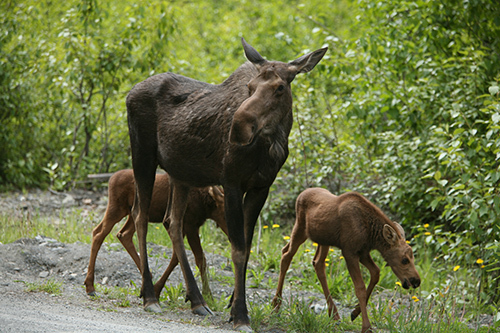 The planned, experimental population in Alaska is part of an attempt to ensure the animals’ long-term survival. But can this “rewilding” succeed in a state that already has numerous megafauna species and other competing strains on its natural resources? Rewilding is a conservation practice that involves reintroducing keystone species and apex predators to areas where they have become extinct. 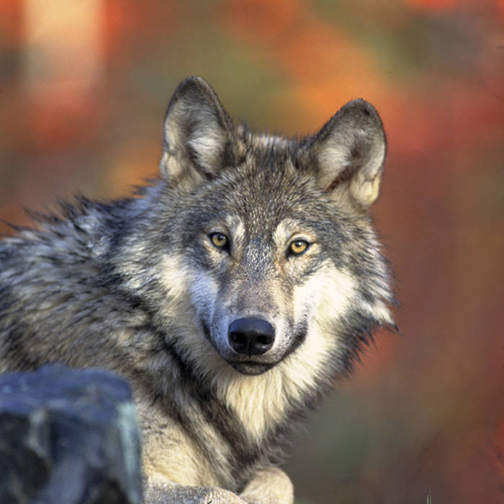 The reintroduction of wolves in Yellowstone is a successful example of rewilding. The Alaska Department of Fish and Game has been involved in evaluating and planning the reintroduction of wood bison since 1991. In 2008, 50 bison from Canada were imported to supplement a smaller herd already being held at the Alaska Wildlife Conservation Center in Portage, about 20 miles south of Anchorage. Today, that herd has grown to about 130 animals. Working with the U.S. Fish and Wildlife Service, the department identified three areas in central Alaska where the wood bison could be reintroduced: in Yukon Flats, Minto Flats and the lower Innoko-Yukon River area. The first release was scheduled for spring 2010 in Yukon Flats—the last place wood bison were known to roam in Alaska in the 1800s—but the effort had to be abandoned since that area is now a national wildlife refuge. The state’s second-preferred release site, Minto Flats, about 20 miles west of Fairbanks, was shelved because of concerns about conflicts with future gas and oil development raised by Doyon, Limited. The current plan is to release the first wood bison in the Innoko-Yukon River area in southwest Alaska. It is hoped that such a release will not only increase the worldwide population of wood bison, but that it will reestablish a keystone grazing herbivore to what was once a natural-grazed ecological community, helping to restore the Northern ecosystem. When environments lose their large herbivores and predator species, the niches those animals once inhabited are left unoccupied, creating an imbalance. Much of North America’s native flora and fauna evolved under the influence of large mammals. But critics of rewilding wood bison to Alaska say that it is unrealistic to assume that natural communities today are functionally similar to their state more than a hundred years ago. They argue that evolution doesn’t stop just because one particular species is removed from a system, and thus the reintroduction of a large mammal could thwart current ecosystem dynamics and possibly cause collapse. Under this premise, the new wood bison would be considered “exotic” and could potentially harm other native North American species through invasion, disease or other means. It’s true that within the historic range of wood bison, there is some potential for the animals to compete with existing large ungulates for forage, providing that both species occur in the same area and the forage item is limited. For instance, the wood bison’s fall use of terrestrial lichens may overlap the forage needs of caribou, and spring browsing of willows may overlap the forage needs of moose. Too, wood bison herds may indirectly influence predation rates on moose by supporting higher wolf densities than would exist without the presence of wood bison. The Fairbanks Daily News-Miner reports that the released wood bison would be classified as a “nonessential, experimental” population, which means that there will be no designation of land for them as critical habitat. Their reintroduction, then, will not be able to hinder development, including oil drilling or mining. Do you think that the reintroduction of a megafauna species can succeed in an area that already has a good number of large animals, particularly if no land will be set aside for it as critical habitat? I also think rewilding is very exciting, especially after the successful reintroduction of wolves in Yellowstone. Ecosystems are like puzzles though, and most of the time we aren’t capable of seeing all the pieces, making it difficult to know if something is missing. So, we still have to ask important questions about how this species will fit back into it’s ecosystem that has been without it for over a hundred years. Is there still a niche for it to fill? Do Bison still fit into the puzzle that makes up the Alaskan wilderness? I always share your posts; they are so interesting. Rewilding is extremely exciting. While the critics supposed statement that, “evolution doesn’t stop just because one particular species is removed from a system,” is true, it has no bearing on my position. All management has a goal. The goal of many wildlife biologists, including me, is to bring ecosystems back to the pre-human disturbance state or as close as is “possible.” Therefore, I support repatriating any species to parts of its historic range from which it has been extirpated when practical and sustainable. 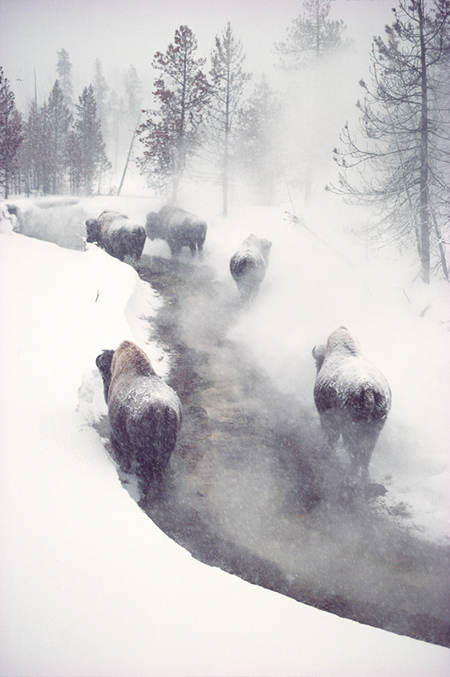 I support wolves in Yellowstone and wood bison in Alaska. Those who may want to preserve a status quo ecosystem may be against these efforts. I am look forward to following the wood bison experiment. There are already bison in Alaska. I nearly hit one on the highway during a snow storm near “Buffalo Center” one year. Alaska certainly has ample public lands, native-owned lands and parks for bison. There has been, and perhaps still is, a limited harvest of these animals. Their habitat, like the caribou, has to have sufficient wind to blow areas nearly snow free so that they can find food in mid-winter. There does not need to be a special bison preserve. Mr. Smith encountered plains bison that were transferred to Alaska in the 1930’s. They are not “native” to Alaska and are struggling to survive outside of the areas they have been relocated to. This article refers to the reintroduction of “native” WOOD bison to lands populated by their ancestors. The plains bison that Mr. Smith encountered are “foreign” and should be sent back south … which is, of course, highly unlikely given the expense of rounding these “outsiders” up. How successful has the Canadian re-introduction been? Are we asking questions that they have already answered? If we can undo some of the damage we’ve caused, then that’s a good thing. Wood bison are a native species and habitat is relatively pristine. Bison eat grasses while the moose in the area browse, so they don’t actually compete. Bringing back a former native species seems like a good idea to me!